Here’s another photo just to whet your appetite. 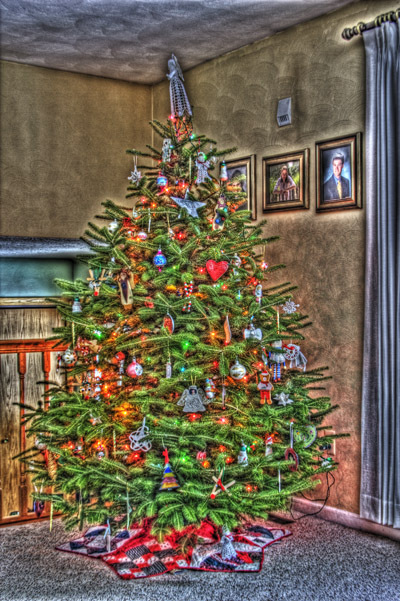 This is a photo of our Christmas tree this year. It was a rather nice tree, if I say so myself. My wife and I shook the snow off many trees before deciding on this one. It was promptly cut, put in the stand positioned in the living room, and decorated. OK, so that part isn’t so special. This photo is a composite of 6 images taken with different exposures. Yes, you can set your camera to intentionally over- and under-expose the image. These were taken at -2, -1, 0, +1, +2, and +3 stops from the “normal” metered exposure. Then, using Photomatix software, I combined these into a single image. The result is termed an HDR image, or High Dynamic Range. There are lots of options when using Photomatix, but this is an example of the creative things you can do with your digital images. As I said, this is just to get you thinking about the possibilities. We’ll cover HDR again in a later post. This entry was posted in Southwest Michigan and tagged Christmas Tree. You’ve executed this scene well in the “traditional HDR style” which seeks to make an interesting image with all available captured photons displayed. Personally, I don’t like that style very much. It doesn’t look “natural” to me. For instance, I know the walls of your house are white, but they’re grey in the image. Were you trying to get glowing lights in an otherwise natural-looking tree shot? I myself photographed our kids in front of our tree (not as nice as yours) and make sure one could see the lights glowing. I chose to try it in one capture rather than HDR (notoriously difficult to include people in HDR—they just don’t stay still. To do that, the tree can’t be lit by anything other than the tree lights themselves. So I attempted to light the kids away from the tree using only my SB800 Nikon flash shoe-style flash, off-camera. I had no light-directing equipment other than a piece of cardboard to limit the light spilled on the tree from the flash diffuser. I had further problems in that my AF on my D70 died the day before. This is the second time this has happened, the first fixed under warranty for free but with it now 5 years old I’m not sinking any more money into it. I was using a 50 mm f1.8 lens but the light was so low on the kids that I couldn’t get the AF indicator in the viewfinder to work. So the kids aren’t really in focus. The kids were great and very patient but the photo wasn’t quite what I was hoping for. If I get more time I’ll blur the background and make the kids look sharper. I’ll send you the photo via email.